Just a 25-minute boat ride from Male lies the wonderful Velassaru Maldives Resort. It’s a five-star luxury resort that delivers impeccable service and value in the Maldives. 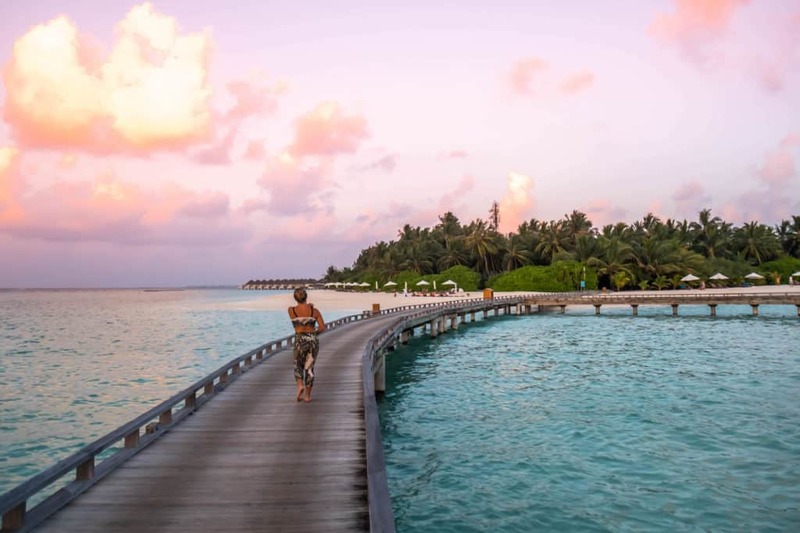 We spent a heavenly three days here, and although we had already been in the Maldives for two weeks, it’s safe to say we didn’t want to leave this resort. Seriously, the Velassaru staff even let us stay in the room until 8 pm the day of checkout because they knew how much we loved it! See the full review below. 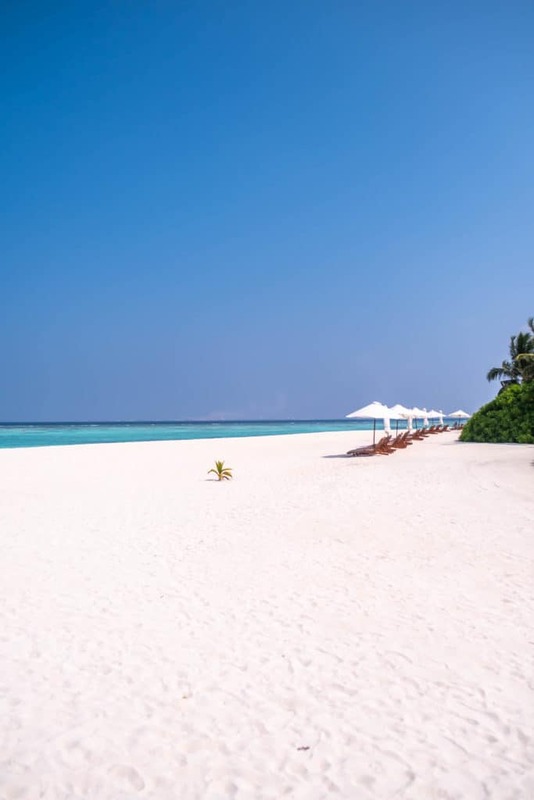 Velassary is only a 25-minute speedboat ride away from Male Airport. 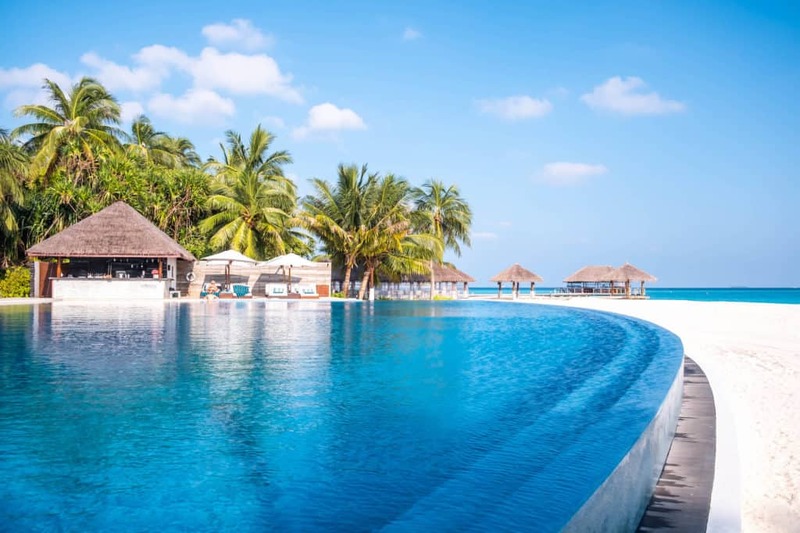 This means transfers in and out of the resort are short and can be done earlier and later in the evening than some of the resorts located further from the main hub of Male. On our last day we were given a late check out of 19:30 because our flight was at 23:00 meaning we had a whole extra day at the resort (can’t guarantee you’ll get that lucky), but we loved that they allowed us to do this. Velassaru is a nice sized resort and member of Small Luxury Hotels. We’ve stayed at previous SLH hotels and found that the hotels within the collection are generally exceptional from the moment you can arrive. The main reception at Velassaru is modern and open air with sand floors setting you in the mood right away to leave your shoes behind. In fact, we spent most of our time in resort barefoot walking between our room, the pool, and restaurants. It’s not a massive island, but they managed to squeeze in five fantastic restaurants and three bars on to the island. 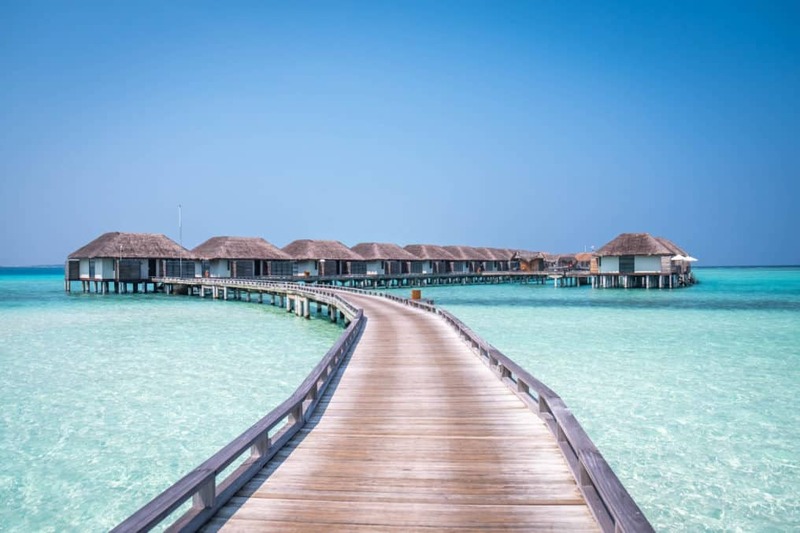 There is a wide selection of modern rooms ranging from double rooms, beach bungalows, water villas, and pool water villas. We spent our time in a luxurious water villa, but even the base rooms looked great and were only a few steps to the beach. 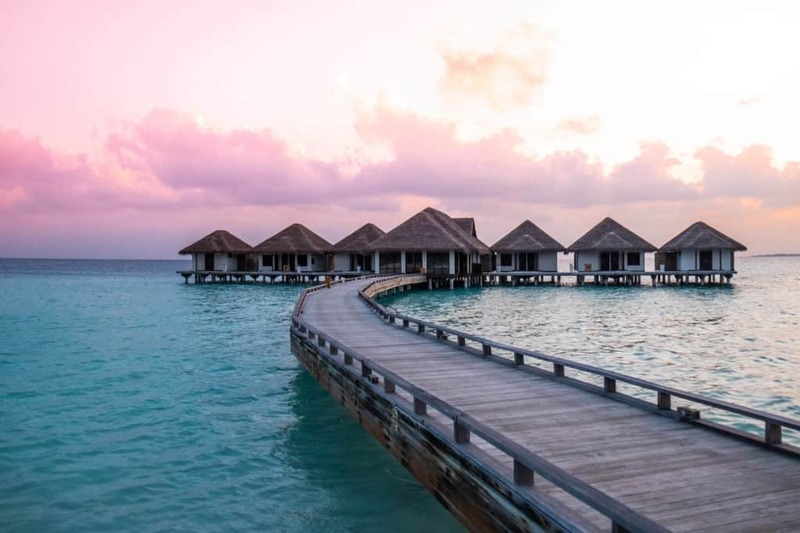 The water villas at Velassaru are luxurious. Upon entering you can’t help but notice the views as the windows are floor to ceiling. Each morning we made it a habit to pull open the blinds as soon as we woke up and sit with a cup of coffee before heading to breakfast. A real stand out for us was the quality of the bed, from the linen to the down pillows and pillow top we were in absolute heaven. Seriously it may have been the best bed we’ve ever slept in and it made for a perfect night sleep. The villa was larger than most New York apartments with a king bed, bar, couch, and a large bathroom. Features like an in wine cooler stocked with over bottles of wine made sure we had no need to leave the room – just had to call in order for some room service. A bathtub located in the center of the bathroom provided views out to the Maldivian blue water. To top it all of we had a bottle of sparkling wine waiting for us along with a number of vegetarian canapes. Other standouts for us were in the details. Things such as a new LCD TV, complimentary on-demand movies, a Nespresso machine, and L’occitane toiletries. The bath even came with a bath bomb to get the perfect soak on with a glass of wine. All of the water villas have a large patio deck with lounge chairs and sun bed to enjoy the ocean breeze in privacy. We spent most of our time on the back deck of our villa taking dips into the water via our staircase into the water. 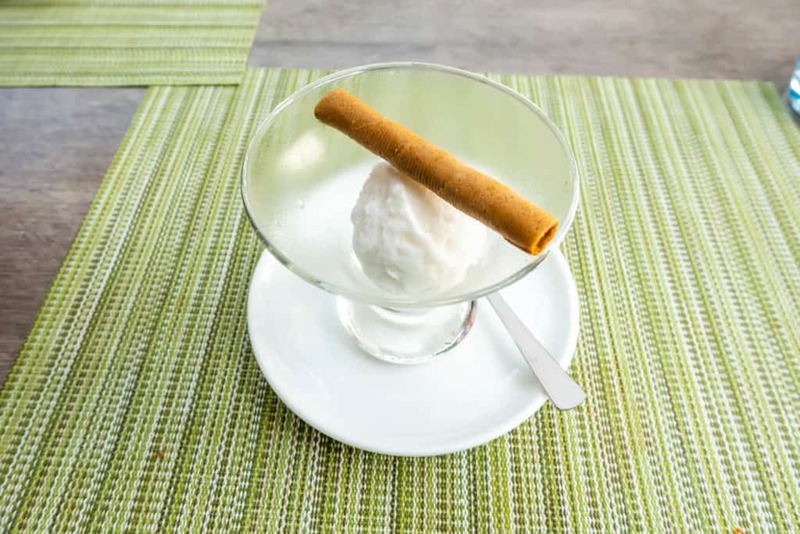 The food varies on your meal plan; however, every booking includes breakfast which is served at the main restaurant. Breakfast and dinner here are large buffets served at Vela it has a wide range of offerings that include a grill station, salad bar, plenty of mains, and healthy options. We had one meal at their Sands Restaurant, an a la carte restaurant, that specializes in grilled seafood and meats. The jumbo prawns we had were so rich and fresh they could have fooled you for lobster. All the food was fresh and the menu actually changed every day while catering to an international audience. For buffet food, the options were really on point! It’s safe to say that Velassaru had the best food we had in the Maldives. You should also take note the eco-friendly straws they had for cocktails and iced coffees. Velassaru was the first time we ever saw an edible straw! The staff at Velassaru are incredibly kind and helpful. The waitstaff was great and had excellent English skills which is not always the case at every resort. Every excursion we had was met with prompt and courteous staff members from all over the world! If all you want to do is relax on the patio of your villa — go ahead! However, there are still many activities for all to enjoy at Velassaru. For starters, if you want to be off on your own you can easily rent a mask and some fins and snorkel around the resort. We had a few nice snorkels around here. The reef isn’t the best, but there is still definitely some life around Velassaru. We like to travel with our own fins, mask, and snorkel so we didn’t have to keep paying for rentals and it was an amazing decision. Plus the gear fits us and no one else has slobbered over the snorkel. If you’re really into snorkeling I can’t recommend your own gear enough. It was a great decision as we’ve been working on our recreational free diving. Other activities include group snorkeling, dolphin watching, diving, kayaking, stand up paddling, kite surfing, and fishing. After a whirlwind tour of the Maldives, we chose to give our time at Velassaru a break and just enjoyed some wonderful cocktails at the poolside bar, Infinity. That doesn’t mean we sat in the sun all day. 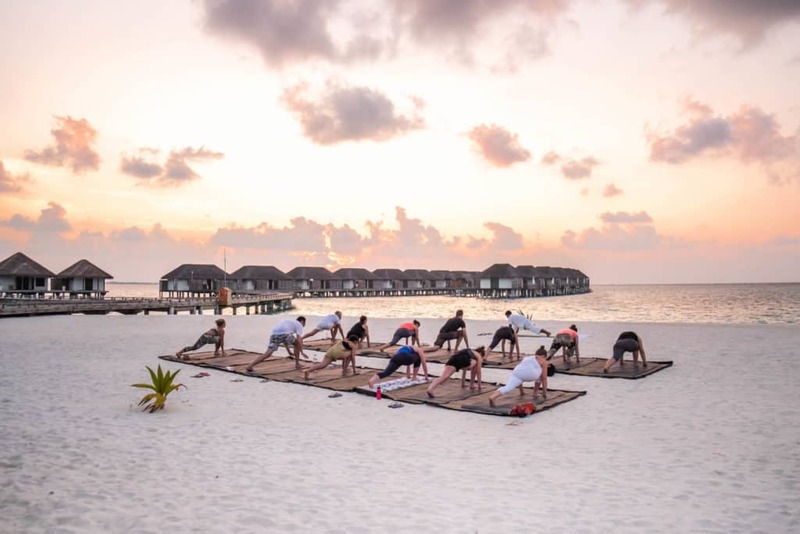 Velassaru offers daily yoga sessions and complimentary ones every few days. So, we took full advantage and enjoyed a sunset yoga one evening. They also offer some wonderful evening entertainment every night. It’s usually a talented band at the Fen bar, but one evening they had a movie night. We’re big film buffs and love any chance to watch a good movie. 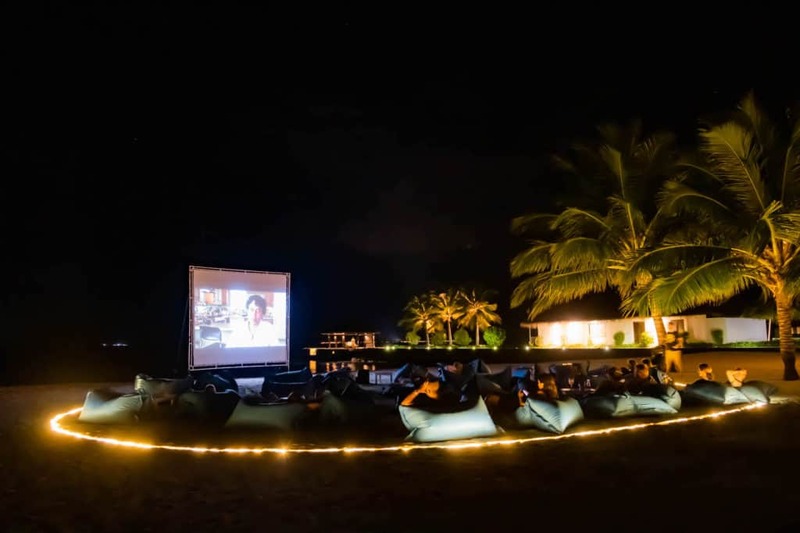 The hotel set up a large screen, a bunch of bean bags, and had plenty of popcorn to go around for a night of watching “Life of Pi” on the beach. 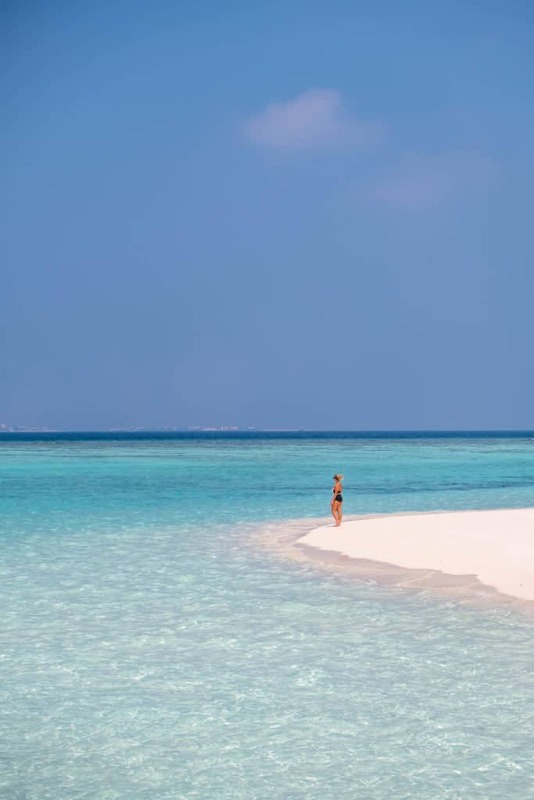 Velassaru had to be one of our favorite resorts in the Maldives and its amazing choice for your holiday. 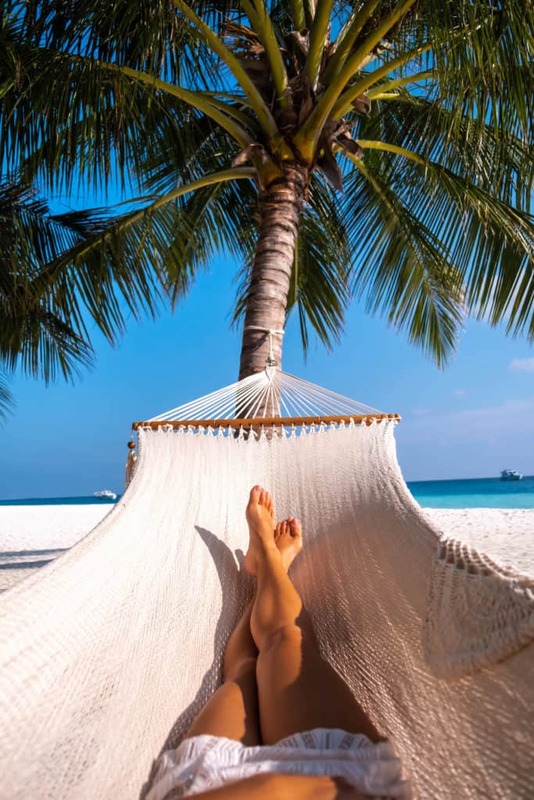 It manages to deliver the same relaxing and luxurious holiday that doesn’t cost as much as some of the big named resorts. 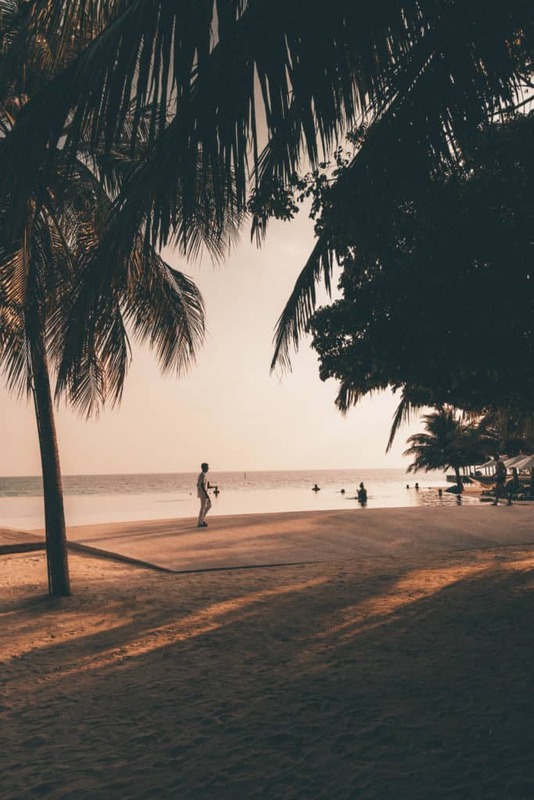 It’s not easy to design a resort that manages to never feel crowded, but that’s exactly what they have done at Velassaru. From the rooms, ambiance, food, and staff the whole experience is top notch and first class.